Simplification of an antiretroviral treatment to a boosted protease inhibitor and the nucleoside analogue lamivudine (a dual regimen) is highly effective in people switching from a stable three-drug regimen, researchers reported on Monday at the International Congress on Drug Therapy in HIV Infection (HIV Glasgow). Boosted protease inhibitors combined with lamivudine have the potential to really reduce the cost of long-term treatment as boosted protease inhibitors come off patent over the next two years in higher-income countries. These regimens may also reduce the risk of any long-term side-effects associated with triple-drug therapy, most notably the bone and kidney toxicities caused by tenofovir. The ATLAS-M study was a multi-centre, open-label randomised study conducted in Italy lasting 96 weeks. It was designed to explore the non-inferiority of a simplified regimen of atazanavir/ritonavir plus lamivudine compared to atazanavir/ritonavir plus two nucleoside reverse transcriptase inhibitors. To be eligible for recruitment, patients were required to be taking stable antiretroviral therapy (ART) with a viral load below 50 copies/ml for at least three months and a CD4 count above 200 cells/mm3 for a minimum of six months. The study population comprised 266 people with a median age of 44 years. The two study arms were evenly matched in baseline characteristics, with median CD4 cell count of approximately 620 cells/mm3, a median of 23 months of prior treatment with viral load suppressed below 50 copies/ml, 84% male in the dual-regimen arm and 75% male in the triple-regimen arm. Seventy-eight per cent in the dual-regimen arm and 83.5% in the triple-regimen arm were taking tenofovir prior to randomisation. At baseline, participants were randomised to atazanavir/ritonavir with lamivudine (dual therapy) or to continue the baseline three-drug regimen. The primary outcome measured in the study was treatment failure at 96 weeks, with participants defined as a case of treatment failure if they had stopped treatment for any reason. After 48 weeks, patients taking dual therapy had a lower rate of treatment failure compared to individuals who remained on triple therapy (89.5% vs 79.7%) and this difference persisted at week 96 (77.4% vs 65.4%). The study found that the dual regimen was statistically superior to the triple regimen, and that this difference was driven largely by a difference in virological failure rates between the two arms (although that difference in itself was not statistically significant) (1.2% in the dual arm vs 6.8% in the triple arm, p = 0.060). Potentially treatment-related adverse events were also somewhat more frequent in the triple-regimen arm, and this difference appeared to have been driven by five treatment discontinuations due to renal colic, probably attributable to atazanavir, in the triple regimen arm, compared with two in the dual therapy arm. Renal colic, urinary tract and bone adverse events were more frequent in the triple-regimen arm, while respiratory tract and skin adverse events were more frequent in the dual-regimen arm, but overall the rate of clinical adverse events was similar between the two study arms. Modest but statistically significant increases in LDL and HDL cholesterol and triglycerides occurred by week 96 in the dual-regimen arm (treatment with tenofovir is associated with lower cholesterol levels) but the overall ratio of HDL to total cholesterol did not change significantly. Patients taking the simplified combination had a higher frequency of elevated triglycerides (8% vs. 2%, p = 0.027), hyperbilirubinemia (60% vs. 36%, p = 0.001), as well as a greater increase in total cholesterol (+15 vs. +0mg/dl, p = 0.005) and HDL cholesterol (+5 vs + 0mg/dl, p = 0.002). Kidney function improved modestly in the dual-regimen arm by week 96, as measured by eGFR (+5 ml/min/1.73m2), and declined in the triple-regimen arm before returning almost to baseline by week 96 in the triple-regimen arm. In resource-limited settings, second-line ART typically consists of a ritonavir-boosted protease inhibitor plus two nucleoside reverse transcriptase inhibitors (NRTIs). Impressive outcomes have been achieved using this treatment but costs, toxicity and the preservation of future treatment options make simplified regimens attractive. The MOBODIP study was designed to evaluate whether a dual regimen of a boosted protease inhibitor and lamivudine was safe and effective for second-line treatment in sub-Saharan Africa. Investigators therefore designed a 96-week multi-centre, open-label, study comparing virological outcomes in patients on second-line ART randomised to take either monotherapy with a ritonavir-boosted protease inhibitor or dual therapy consisting of a ritonavir-boosted protease inhibitor plus lamivudine. Patients were recruited in Cameroon, Senegal and Burkina Faso. To be eligible, they were required to be taking stable second-line ART consisting of a ritonavir-boosted protease inhibitor and two NRTIs, with a viral load below 200 copies/ml, a CD4 count above 100 cells/mm3 and adherence above 90%. The study protease inhibitors were ritonavir-boosted darunavir or ritonavir-boosted lopinavir. The primary outcome was virological failure at week 96, defined as either a confirmed viral load above 500 copies/ml, reintroduction of a dual NRTI backbone or interruption of the protease inhibitor. A total of 265 patients were randomised. Most (73%) were women and the median age was 42 years. Median CD4 count at baseline was 475 cells/mm3. The median duration of second-line ART was 37 months. At the time of first-line treatment failure, 96% of participants had the M184V mutation which confers resistance to lamivudine. The study’s Data Safety Board met in March 2016 to analyse 48-week outcomes. They recommended interruption of the monotherapy arm. In the intent-to-treat analysis, 3% of patients taking dual therapy had experienced virological failure compared to 23% of patients taking monotherapy (p < 0.001). Median time to treatment failure was 24 weeks. Following the reintroduction of the NRTI backbone, all patients except one reestablished virological control and the median time to viral suppression was ten weeks. Gains in CD4 count favoured the dual regimen (48 vs. 7 cells/mm3). Frequency of adverse events did not differ between the study arms. There was no association between adherence, nadir CD4 count, nor specific protease inhibitor and virological failure. The only factor associated with virological failure was receipt of boosted protease inhibitor monotherapy. The study investigators concluded that inclusion of lamivudine in the second-line regimen confers an advantage despite the presence of lamivudine resistance at baseline, and that lamivudine may maintain a resistance mutation that impairs HIV replication, reducing the risk of virological failure. Gagliardini R et al. Simplification to atazanavir/ritonavir + lamivudine versus maintaining atazanavir/ritonavir + 2 NRTIs in virologically suppressed HIV-infected patients: 96-week data of the ATLAS-M trial. International Congress on Drug Therapy in HIV Infection (HIV Glasgow), Glasgow, abstract 0121, 2016. Ciaffi L et al. Dual therapy with a boosted protease inhibitor plus lamivudine is an effective maintenance strategy in patients on second-line antiretroviral therapy in Africa: the ARNS 12286/MOBIDIP trial. 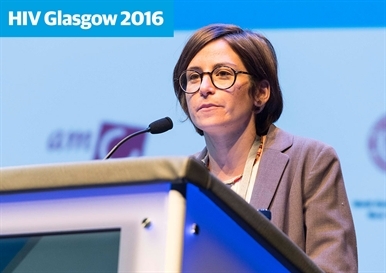 International Congress on Drug Therapy in HIV Infection (HIV Glasgow), Glasgow, abstract 0122, 2016.